After a fairly successful launch that saw Dragalia Lost net 3 million US dollars in revenue, this week the mobile app will welcome its first raid event and the time to prepare, is now. For those of you who are unfamiliar with what a Raid event is, especially in gacha games, they’re a special type of mission that a lot of the time, sees players having to band together, in a bid to take down a big bad monster, or fight another group of players. Raid Events are notorious for ramping up with difficulty and offering great rewards for those to earn them and in gacha games, those rewards can often include a rare character/hero/demon and etc. What is a Loyalty’s Requiem? What can I expect from Loyalty’s Requiem? If what has been datamined holds true, players will be able to form a friendship with temporarily available characters and by completing quests, the friendship can strengthen. By achieving the maximum friendship, the temporary character (the name “Celliera” has been provided,) will actually stick around, as you have earned the right to keep hold of them, long after the event has ended. They will also keep the level you have attained with them. Furthermore, if the event ends, whilst you’re still in a battle, you will be allowed to finish it as the results are being calculated. You will also receive rewards based on your performance during the whole event. Also, should you receive a “resettable dragon Pele,” players will be able to resent the content in which they summoned, but after your fifth reset, you’ll have no choice but to accept what you have summoned. But that’s not all, apparently, the actual battles themselves that require 16 adventurers working together, is actually 4 players working together, with each one able to use 4 of their own characters. The battles will also have three difficulties: Beginner, Standard and Expert. Anyone who wishes to join a room, are free to do so, at the cost of Getherwings, but if you wish to be the host, you will need Otherworld Fragments, which are earned from Boss Battles. The upside to this, is if you beat a Raid Battle on the expert difficulty, you’ll also be able to do an extra raid battle. In the event you fail it, you will be welcome to try it again. Lastly, for the duration of the event, there will be Daily and Limited event quests for players to complete. When does Loyalty’s Requiem Begin and End? *Event schedule and content may change without warning. Are there any Prerequisites I need to be aware of for Loyalty’s Requiem? Absolutely there is. If you have not out a lot of time into the game’s main campaign already, you will need to correct that. In order to even participate in Event Quests, players are required to clear Chapter 2 /2-1 on Normal difficulty. Clearing Chapter 2 /2-1 also allows players to engage in co-op battles, which is a necessity for Loyalties Requiem. Is there anything I should do in the meantime to prepare for Loyalty’s Requiem? 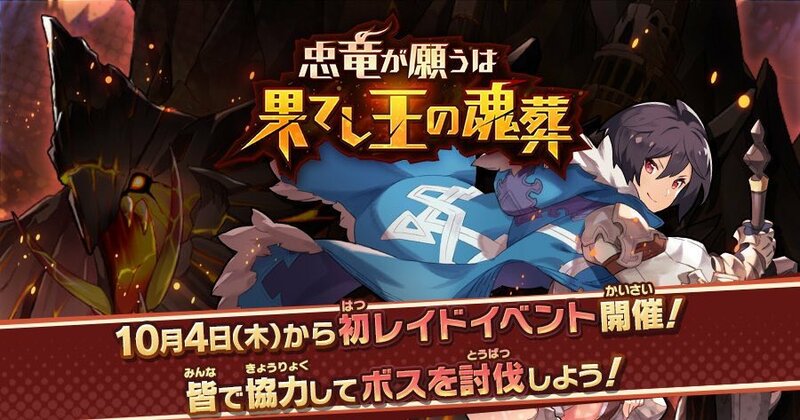 Although we haven’t got too long before the event kicks off, being an event with a Raid Boss, whose element is Fire, it would not hurt if you took the time to strengthen whatever Water attributed adventurers and dragons you have. A couple of ways you can do this is, is by taking advantage of the Avenue to Power event quests and gridning for the upgrade items. You can also forge a better bond with your beloved dragons. You can also strengthen your weapons, forge new ones and spend some time over at your castle, and upgrade facilities.